Aasimars are humans with a signif icant amount of celestial or other good outsider blood in their ancestry. Aasimars are not always good, but it is a natural tendency for them, and they gravitate to good faiths or organizations associated with celestials. Aasimar heritage can hide for generations, only to appear suddenly in the child of two apparently human parents. Most societies interpret aasimar births as good omens. Aasimars look mostly human except for some minor physical trait that reveals their unusual heritage. 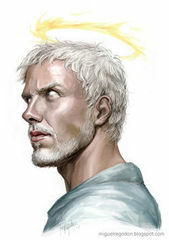 Typical aasimar features are hair that shines like metal, unusual eye or skin color, or even glowing golden halos. +2 Charisma, +2 Wisdom: Aasimars are insightful, confident, and personable. Skilled: Aasimars have a +2 racial bonus on Diplomacy and Perception checks. Light-Touched: Aasimar are always considered to be Light-Aligned, unless their chosen class would dictate otherwise. Spell-Like Ability: Aasimars can use daylight once per day as a spell-like ability (caster level equals the aasimar’s class level). Celestial Sorcery: Aasimar sorcerers with the celestial bloodline treat their Charisma score as 2 points higher for all sorcerer class abilities. Languages: Aasimars begin play speaking Common and Celestial. Aasimars with high Intelligence scores can choose any of the following bonus languages: Draconic, Dwarven, Elven, Gnome, Half ling, and Sylvan.